First weekend in May 2018 gave me and my good friend Mike our first opportunity in four years(!) 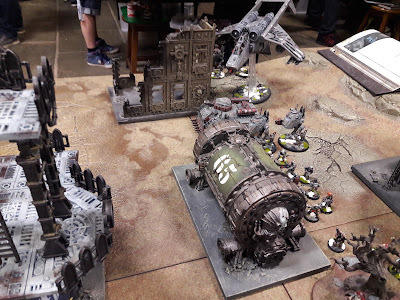 to get together for a game of Warhammer 40K. We both live in very different parts of the country and would meet up at a vaguely central location (Warhammer World in Nottingham) a couple of times each year to catch up and do some gaming. Real life has been a sticking point for the last few years so this has been impossible for us. However, we're back in the game now. 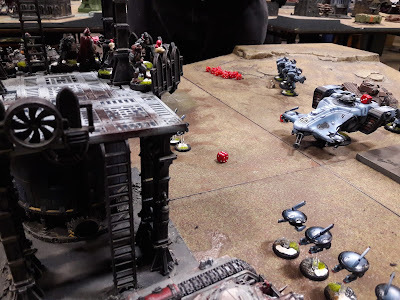 This was our first opportunity to play the 8th Edition rules, with 7th Ed. having entirely passed us by. We made loads of mistakes, learned a bunch of stuff and had a ball. Here's how it went. The mission played denoted a short-edge - short-edge deployment style. 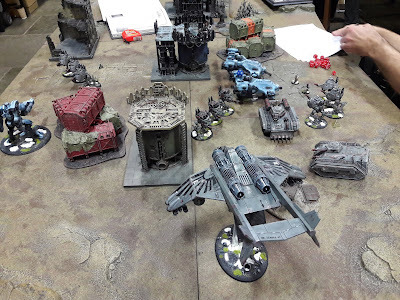 The Astra Militarum had slightly more scenery of their end of the table than the Tau. This meant that Mike was able to deploy slightly closer to his line than I was. He placed one unit of Fire Warriors atop a scenery piece and deployed the other two in Devilfish. Aun'va in cover behind building "2", Fire Warriors on top of it. XV-8 Battlesuits on the right flank, XV-104 on the left. I deployed a Heavy Weapons team in my Valkyrie, an infantry squad in the Chimera and placed everything else as close to my deployment line as possible, intending to spearhead with the Sentinels and Chimera. 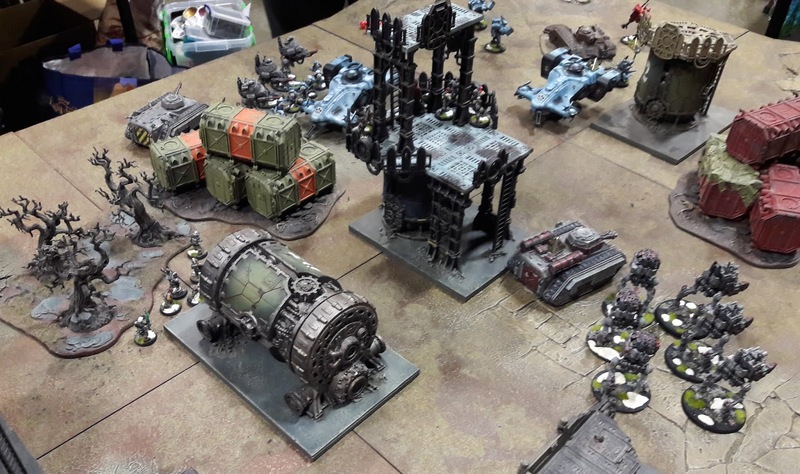 The mission dictated that VPs would be earned for each unit destroyed, the death of the enemy commander, first blood and having a presence in the enemy deployment zone at the end of the game. Astra Militarum got the first turn. The Imperials move up. This is an indicator of the way the game was going to go. 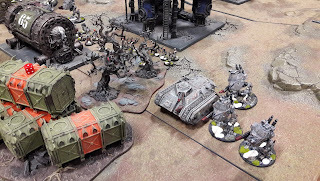 It had been such a long time since I'd played, a new ruleset and a chance to field two armies (that I'm proud of creating) that I found all logical thought, planning and control just leaked out of my ears and I basically declared a "Waaaaggghhh!" and moved right in there. 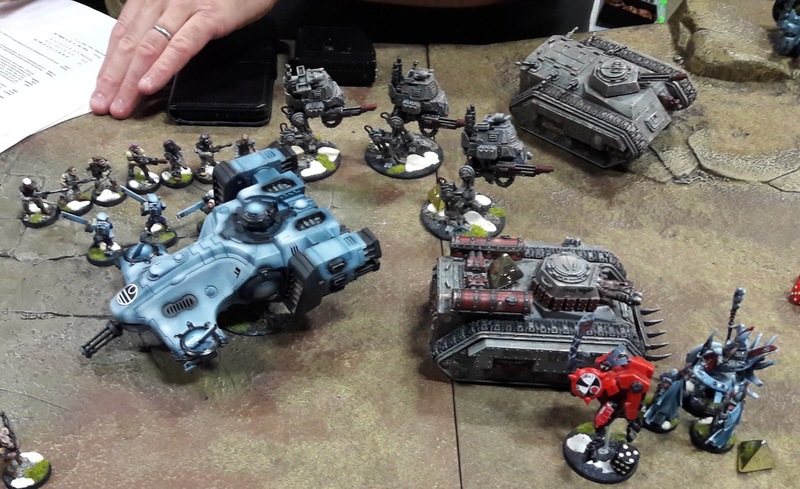 My Commissar and Ogryns used the Dagger of Tu'Sakh to deploy behind enemy lines, the Valkyrie nipped round the back of the Tau Lines too. The Valkyrie opened up with everything it had on the Tau infantry on top of "Building 2" wiping them out to a man. 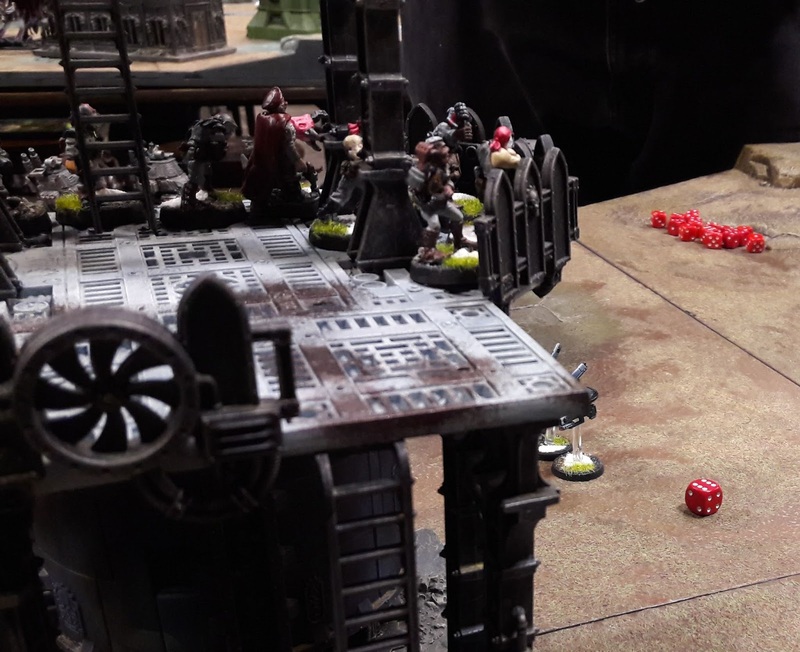 The Commissar and Ogryns fired off a few shots, but barely scratched paint. The Plasma-wielding Sentinels moved up and started what was to be a long-game of bullet-tennis with the Riptide (they would spend the entire game standing and shooting at each other). Imperial Infantry moved up using cover of the buildings. 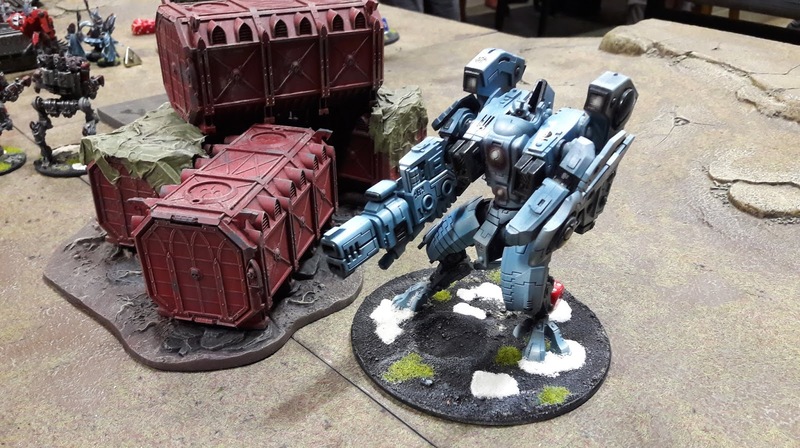 Mike had the Tau play things more cautiously. 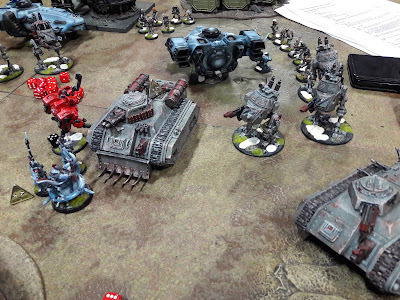 His battlesuits on his right flank summarily disposed of the threat of the Ogryns, wiping them out to a man and wounding the Commissar. I'd been foolish to have dropped them in when and where I did, but as I said I was totally gung-ho on the day. 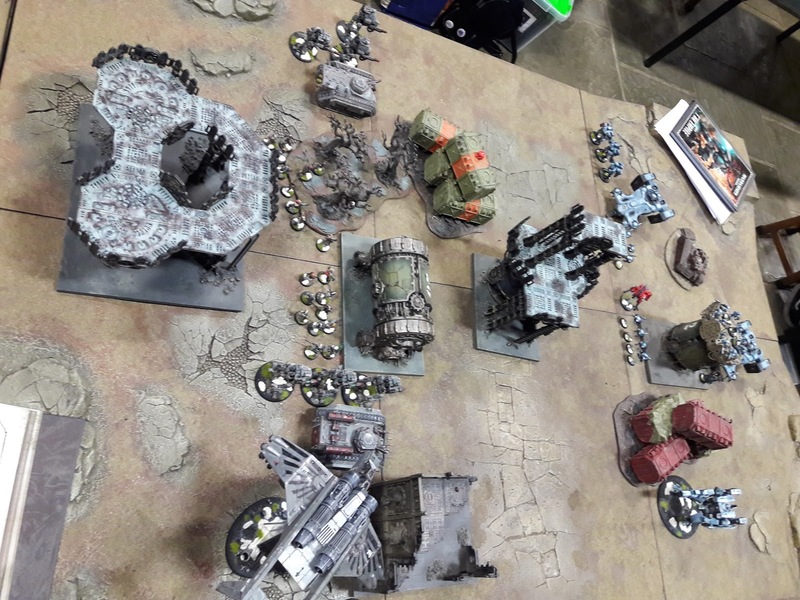 If my recollection is correct, the Tau declined any further movement on Turn 1. The Riptide returned fire from the Sentinels, but to little avail. The Imperials continued in the same vein: Move up, shoot. 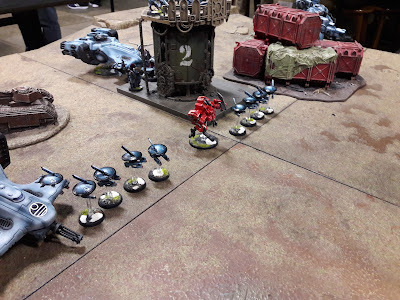 The Valkyrie backed off a little ready to deploy a payload of troops in Turn 3. Less harm was done this turn overall. The Tau started to take the fight to the Imperials, however. The BattleSuits wiped out the Commissar whilst the riptide returned fire on the Armoured Sentinels. Drones advanced and poured fire into the advancing Hellhound, but did no damage (they did, however, provide an obstacle for the advancing tank which is by nature a close-assault vehicle. Therefore they effectively stalled it's advance). 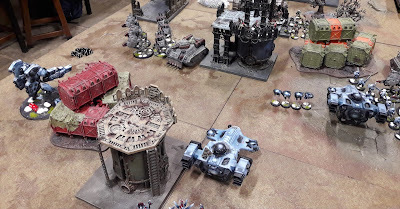 A unit of Fire Warriors is deployed from the Devilfish on the Tau right flank, forming a firing line opposing the advancing Sentinels and Chimera. Look carefully - the guardsman in the centre of the photo is a Beastman! This was my "dumb turn". 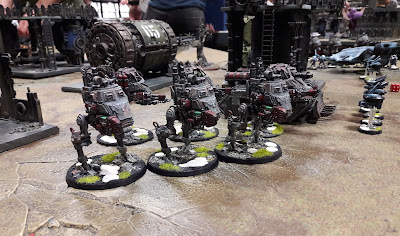 I deployed a Heavy Weapons team out of the Valkyrie. The Tau General, O'Shova killed it. For some reason instead of staying back and shooting, I charged the Tau infantry on the Tau right flank with my Sentinels. Sentinels are rubbish in close combat. I think I killed just one Warrior but took a couple of wounds in return. I did manage to get rid of the four Drones that were harassing the HellHound. In return the unit atop the tower in the centre of the table took heavy casualties from fire from Drones and Devilfish. The Riptide and Sentinels continued trading fire, the Sentinels causing more damage than the Riptide. Told you to watch those Sentinels! 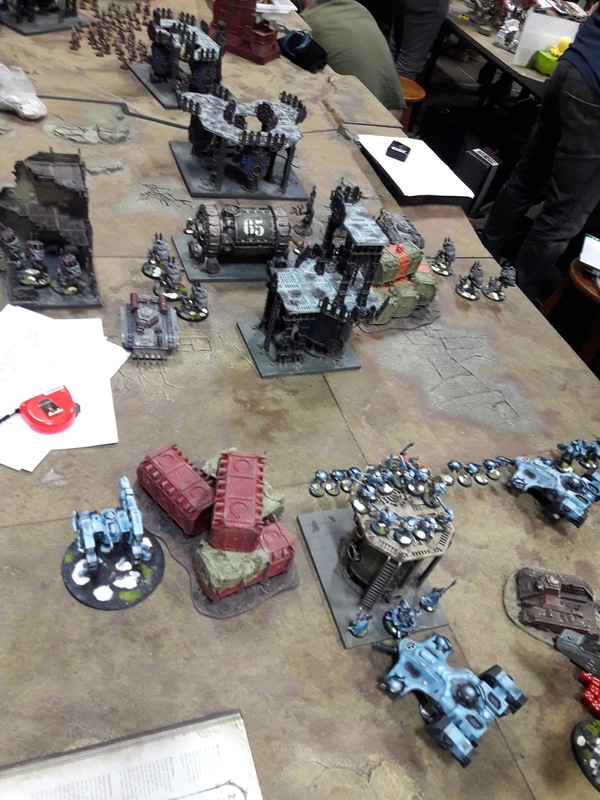 Realising my mistake with the Sentinels who I'd put in close combat with the Fire Warriors, I pulled them out of the fight and instead moved them further towards the Tau back line. 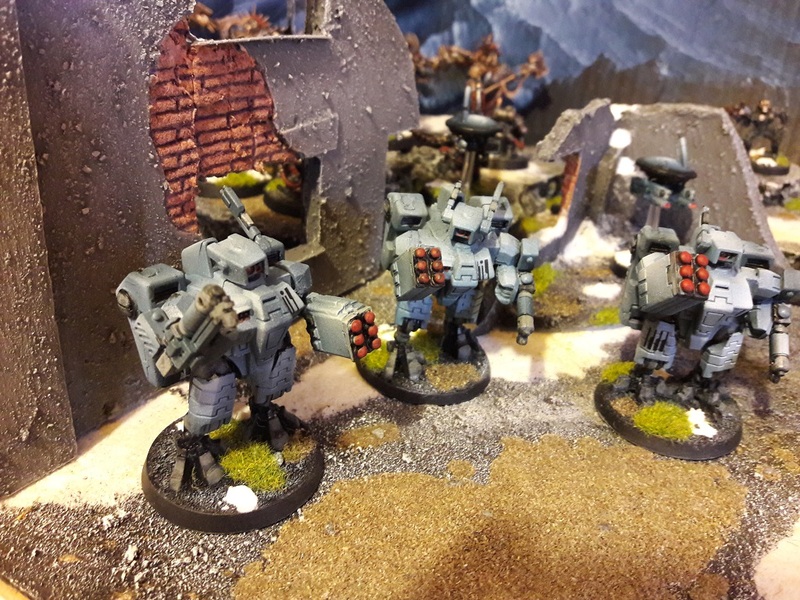 They joined forces with the Chimera on Mike's right flank and started throwing multi-laser shots at the Battlesuits. I'd made another mistake in the previous turn which was that I'd failed to disembark a unit of guardsmen from the aforementioned Chimera on Mike's right flank. 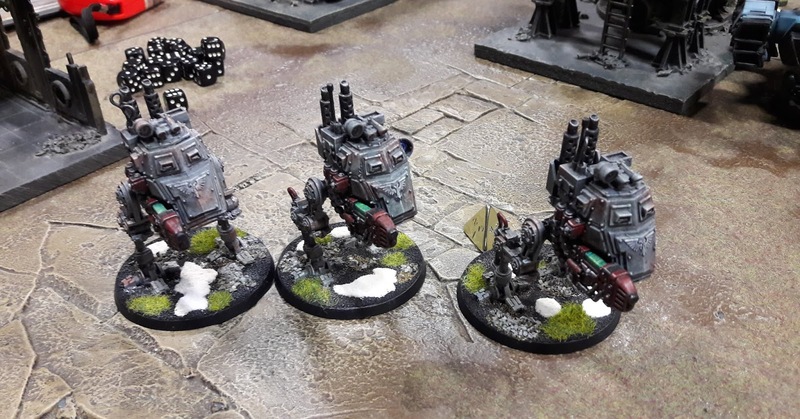 They deployed this turn and started shooting at the Fire Warriors that the Sentinels had retreated from. Several were killed in the firefight. This was not a turn that was entirely slanted towards Imperial victory, however. The Tau wiped out the Imperial general and the remainder of the infantry squad that were ensconced in the tower. Having wiped out the Imperials behind their lines, O'Shova and Aun'va joined the melee in the middle of the table by physically assaulting the Hellhound. The Riptide took some fairly heavy damage from the continued plasma rain from the Sentinels. I think it was this turn that pushed the Riptide into a less performant mode due to damage. Turn 5 is where the Imperial Imperials, as opposed to the Tau Imperials, cemented their victory. What had been a fairly steady push forward became decisive. 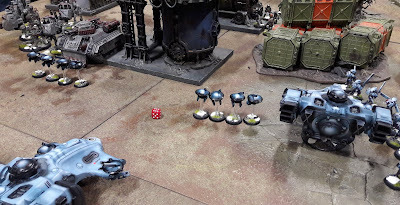 The Hellhound and Sentinels nearest O'Shova and Aun'va managed to score significant wounds on the Tau leaders. 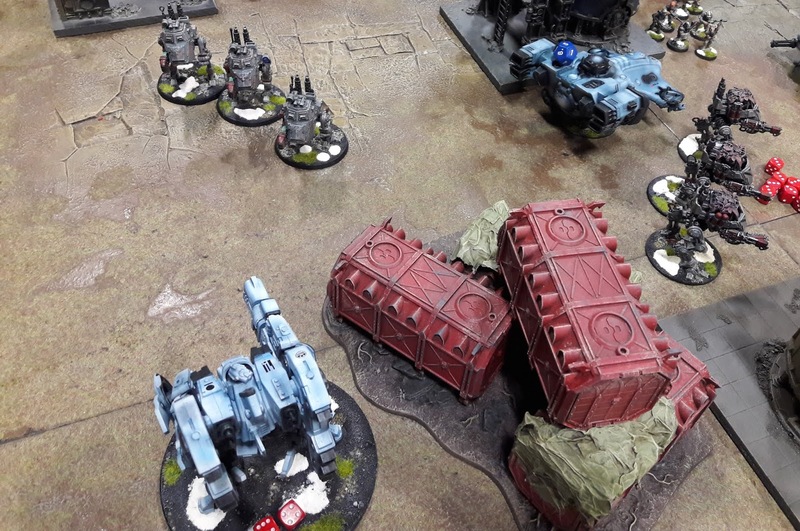 The Chimera and Sentinels continued firing on the Battlesuits and again did real damage. 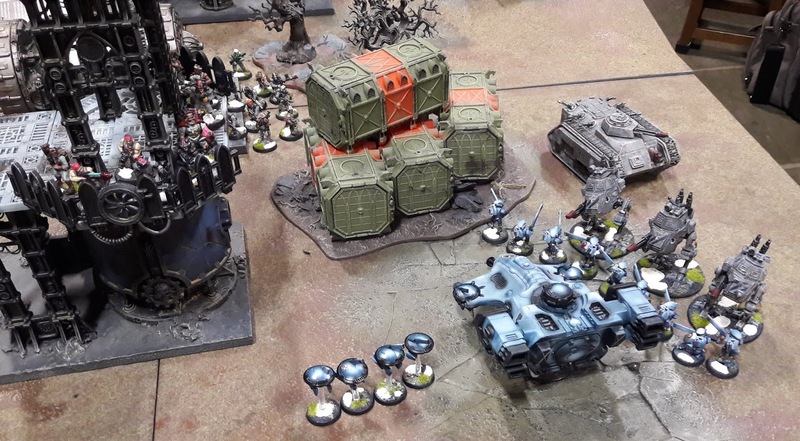 The guardsmen engaged with the Fire Warriors also did significant harm to their foes. 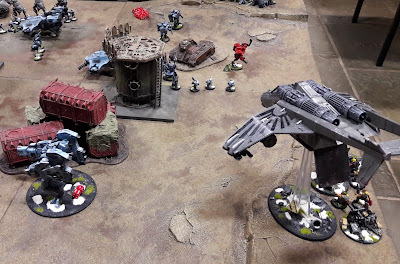 On the other side of the table, the Sentinels with the plasma weapons again knocked bits off the riptide. Other Imperial models tried without much success to damage Devilfish. The Tau didn't go down easy: The Riptide broke away from its firefight with the Setinels, having had very little effect on them throughout the battle. It turned its attention to the Valkyrie which had been harassing the Tau back-line all the way through the game. Damage *was* done, but too little, too late. The Fire warriors returned fire on the guardsmen taking a few down, whilst the Battlesuits fought back against the advancing Sentinel/Chimera, again causing some damage. 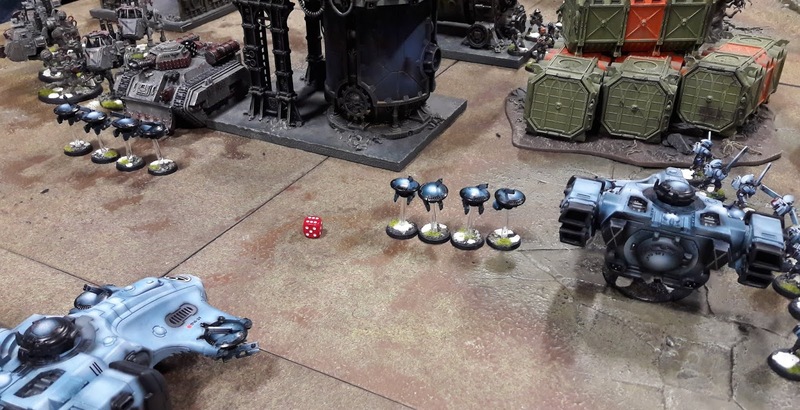 The dice was rolled according to the mission brief - we were going to a 6th turn. 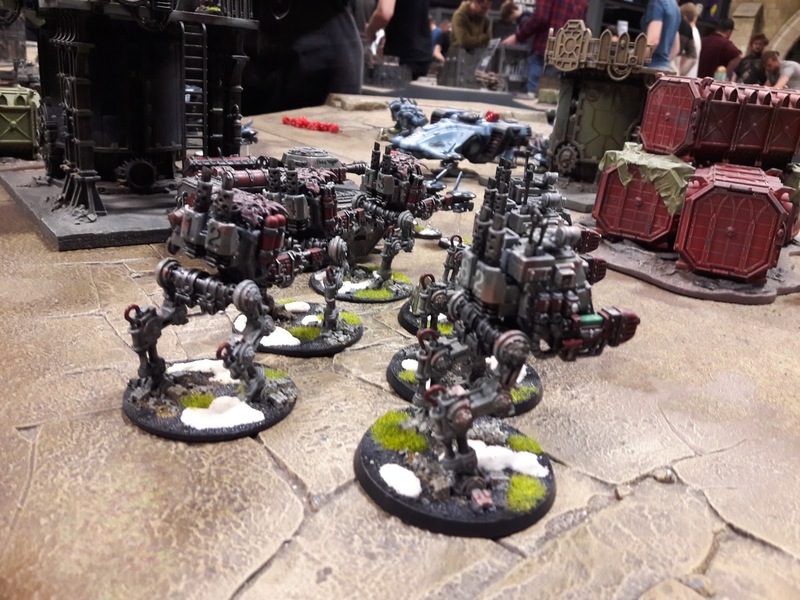 And it's all over for the Tau. In the Imperial turn, the Valkyrie put some distance between itself and the advancing Riptide and joined the fray in the action hot-spot. Joining forces with the two unit of Sentinels on that side of the table and alongside the Hellhound, they together manage to take out Aun'va and O'Shova. 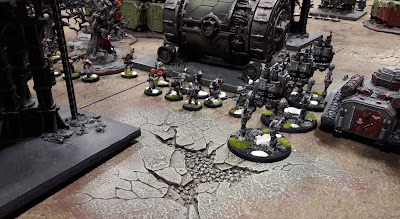 The remaining guardsmen finish off the Fire Warriors. Mike (the Tau Emperor), without taking his turn, declared defeat. 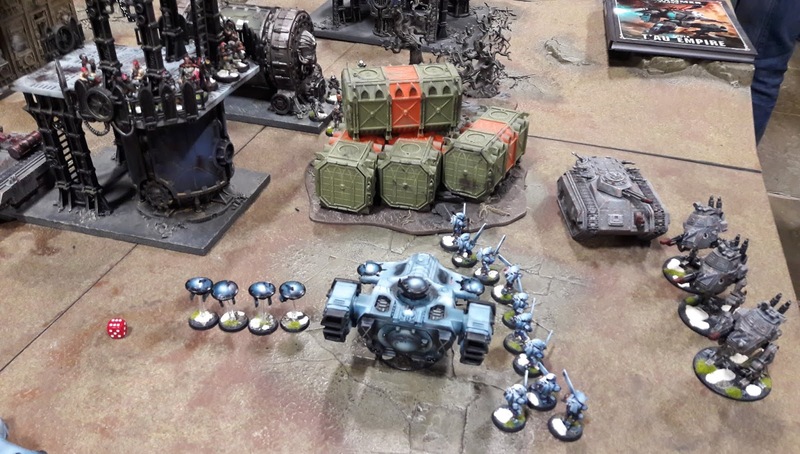 If my recollection is correct, all that remained of the Tau force at this point was the two Devilfish and the debilitated Riptide. The 'tide has turned. Literally - it's facing the other way! What a hoot! But we made so many mistakes! First, I think it's fair to say that we found Warhammer World a slightly frustrating place to game in. We've been there many times before, but this was our first visit in several years and the whole place had been refitted in order to massively expand the GW store and also to fit a ForgeWorld store in. That has reduced the gaming area to something like 1/3 the size it used to be. 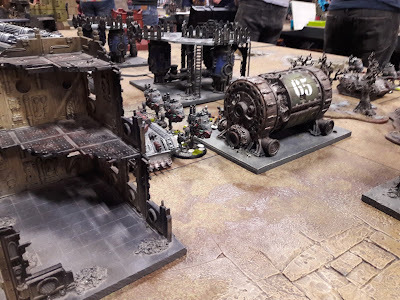 We'd booked a table well in advance, so that wasn't an issue, but it was a little more cramped than before, a heck of a lot louder and there was one other major frustration: The gaming hall's air-conditioning is mental! It was blowing our paperwork all over the place. 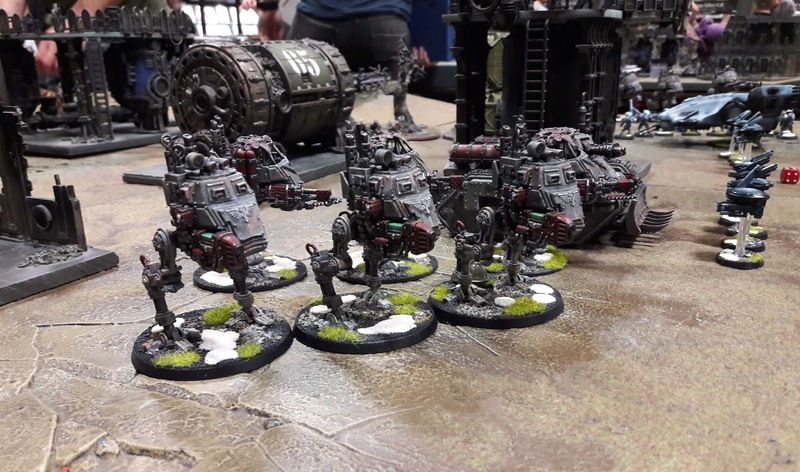 I didn't appreciate how much more solid vehicles and walkers are under the new rules and as a result I didn't give the best weapons load-out to the armies when building the lists. That made it almost impossible for either of us to do any significant amount of damage to each others' vehicles. Are we going to do it again? Damn right - later this year. Age of Sigmar (which again, neither of us has played before. My Stormcast versus a Nurgle force Mike is working on). 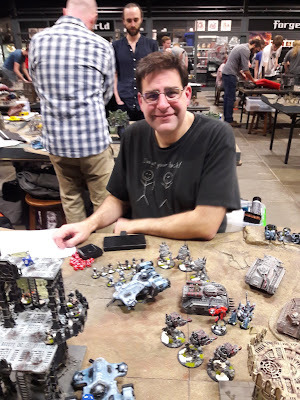 My good friend and Tau General, Mike. Thanks, Mike - great game! This unit gave me gyp! 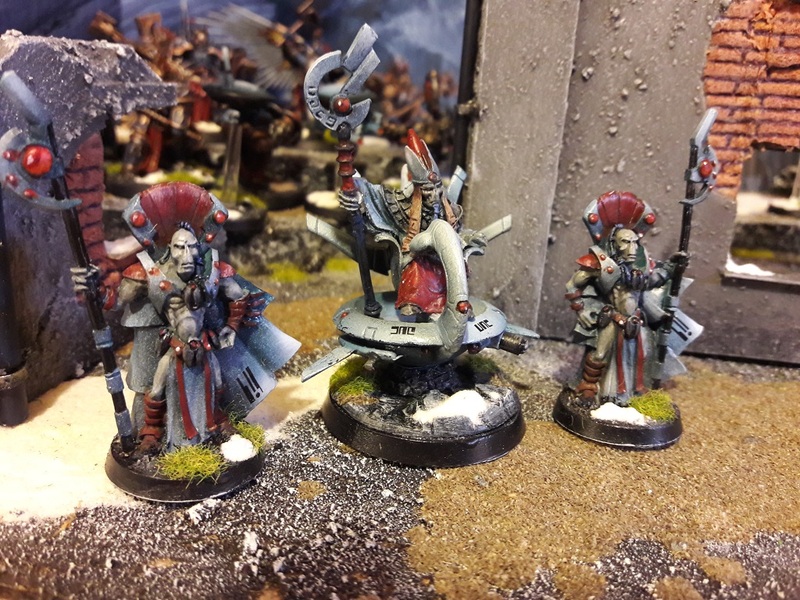 The Aun'Va model hasn't changed much over the years, except that it was originally moulded from metal, rather than the FineCast stuff that's around these days. This is one of the metal models. 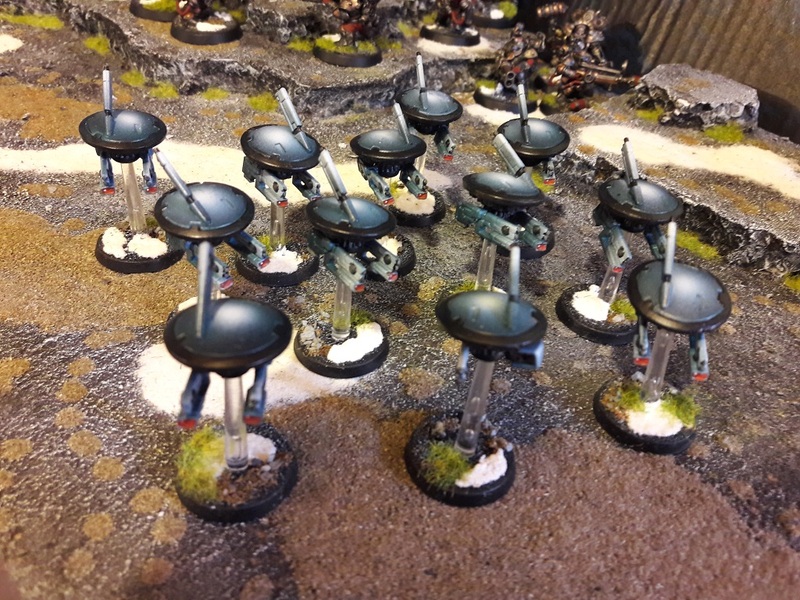 I took the same approach that I have with the rest of this army: No Metallic colours and every model should feature some airbrushing. I also wanted it to blend with the rest of the army and as such I decided to vary from the traditional colour scheme for Aun'Va and use the same pale blue recipe I'd cooked the rest of my army in. Traditionalists: don't moan at me. I won't be listening. The gyp? Simple - I found that handling these models was enough to rub paint off as I was working with them. It got very frustrating very quickly. Here is the second of my three units of Tau Drones. Being a bunch of reconditioned models bought for cheap off eBay, these guys needed a bit of work. If you are keen-eyed, you will spot another home-made Markerlight drone and also a drone with a home-made antenna. It saves me a boatload of cash. 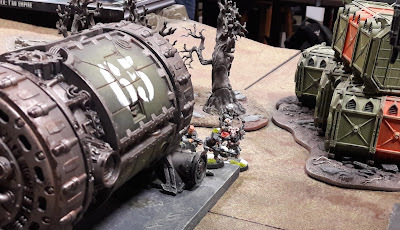 Point 1) occasionally makes me wonder if the amount of work we do on our models from one day to the next is even worth it if nobody's looking closely enough to notice them. Something else that was sorely missing from my Tau army was Battlesuits. Aside from my XV-104 Riptide I had none (I counted them. Twice). 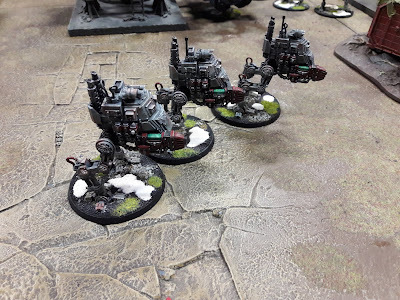 Like most of my armies - I'd done a huge collecting job, consigned them to boxes and then run out of steam/time/interest/money and by the time I needed to paint them something else had my attention. But with a game on the horizon, something needed to be done. So I did it!